The big news around here is the arrival of our new day-old chicks. I have fifty baby chicks to keep warm and look after, much like a mother hen except I use a heat lamp instead of cuddling up with them. They were shipped from the hatchery by the United States Postal Service to our local Post Office. The Post Master called me to let me know they were ready for me to pick up. This is a unique service that the Post Office provides. 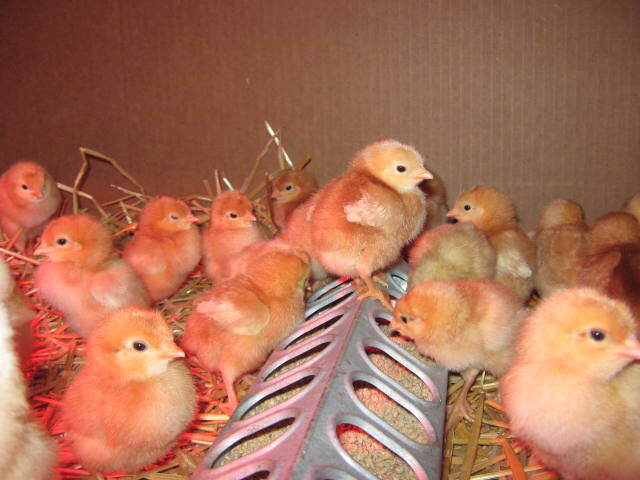 UPS, FedEx and other shipping companies don’t ship chicks. It’s one more reason, in my opinion, to support our Postal Service and not let it be disassembled by outside competitors. Even at 24 hours old, chicks eat, drink, run and scratch without needing to be taught by a mother hen. This latest group of new arrivals will be replacing our flock of old hens. The old gals are not laying enough eggs to pay for the feed they eat, even when they are able to forage out in the yard. So, it’s time for them to move on to the next stage of chicken farming — meat. Old hens don’t make very good fried or roasted chicken, they are just too tough and scrawny. They do however, make the most delicious chicken broth you have ever tasted. I tell that joke every time I pull a hen out of the freezer and it always gets the same response from whoever hears it — silence followed by a quizzical look. I’ll keep the old hens around until the newcomers begin laying, about 18 weeks from now. Many years, I don’t even bother planting peas. More often than not, the spring weather around here is just too warm to grow much of a crop. Peas need cool growing temperatures to grow otherwise, if the temperature gets too high, they just quit growing and never produce. That goes for all types of peas: shelling peas, snow peas and snap peas. Shell peas are the type of peas we buy in the frozen food department. Those have already been shelled from their pea pods and quick frozen. Snow peas are the flat-podded peas used in Chinese cooking. Snow peas are harvested while the pods are still quite flat and the peas inside are just beginning to swell. I like to plant snow peas because they’re essential for stir-frying. Snap peas have edible pods too but they are not snow peas. They are harvested and eaten much like a green bean, when the peas are larger but still tender. ‘Sugar Snap’ is one of the first ever varieties of snap peas developed. This spring is shaping up to be a good pea growing year. I plan to get an extra large spot planted just as soon as the soil temperature warms up to 45 degrees F.
Most pea seed these days are sold as untreated seed. 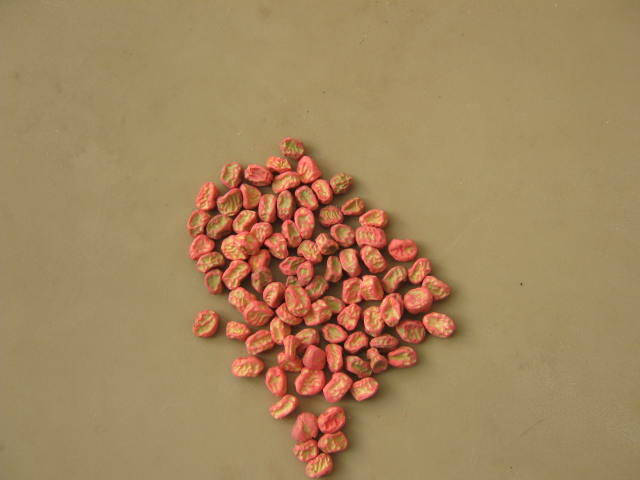 Treated seed is covered with a chemical that helps protect the seed from rotting in cold damp soil. It is identified by it’s brightly colored dye. You might want to try planting peas too. You just might end up with enough peas to make a meal or two with some left over for freezing. By the way, the flowering plant called sweet peas are not edible. The belong to an entirely different genus. For many years I started seeds without using a seedling heat mat.There never seemed to be any problems doing it that way as long as I was able to find a warm spot for my seed trays. Those were the days when the tops of refrigerators radiated heat and were nice and warm. That was the best place to germinate small amounts of seeds because the constant heat warmed up the seed starting containers to the ideal temperature. Small heat mats for home use were not readily available back then. It wasn’t until I worked in a large private greenhouse that I really found out the advantages to using bottom heat. I needed to grow thousands of flower and vegetable plants from seed. Time was, and still is, a valuable commodity, I couldn’t afford to wait for seeds to sprout. Seeds I grew on heat mats seemed to jump up through the soil surface compared to their unheated brethren — germination percentage went up too. After the first transplant growing season, I invested in a few large commercial heat mats. These days, nearly all garden centers sell small heat mats. They are usually preset at a specific temperature and are not adjustable, unlike the commercial mats. Heat mats will last for years if you use them properly and store them carefully. The small mats work just fine for small amounts of seeds. By small amounts, I mean you can still germinate enough seeds to grow hundreds of plants. That’s more than enough for an average home garden. 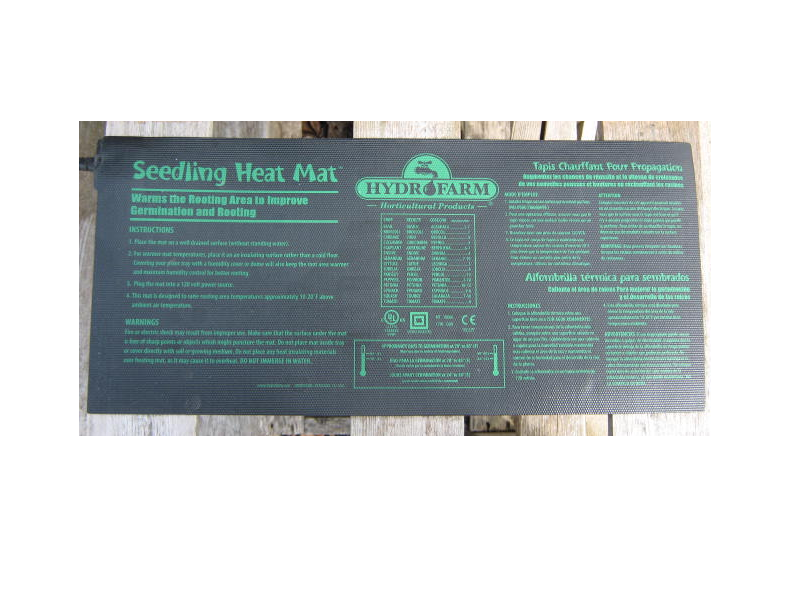 If you are even a little bit serious about growing plants from seed, a seedling heat mat is an essential investment, especially now that refrigerators aren’t warm anymore. Plants need light for photosynthesis and without light they can’t grow. But not all light is equal. If you remember from your middle school science class, sunlight contains many colors or wave lengths of light. Plants mainly use the blue and red part of the light spectrum and not much else. Seedlings need good quality light to thrive. The ideal place to grow seedlings of course, is in a greenhouse or sun-room where there is plenty of natural sunlight. However, not everyone has access to a space like a greenhouse. A south window can help, but even in that case, supplemental lighting may be needed. An adequate substitute for natural sunlight is light from fluorescent bulbs. Special “grow lights” are available but are quite a bit more expensive than standard fluorescent tubes and they don’t last as long. Research has shown that plants do as well or even better under “cool white” bulbs. 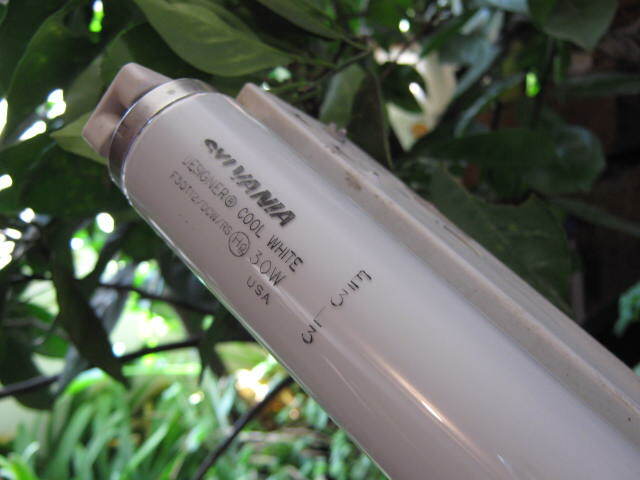 Cool white bulbs provide plenty of blue light. You don’t have to spend a lot of money for supplemental lighting. I bought this light fixture for one dollar at a garage sale. I had to buy a new bulb separately. Despite all of the newest research, some gardeners still feel that seedlings grow better if the light is “blended”. So, they’ll add a “soft white” bulb to a florescent fixture to provide some red light for their seedlings. The plants certainly look more natural under mixed lights. Shining light from an incandescent bulb onto the seedlings will also add some red light. Most vegetable and flower garden seedlings need bright light, at least 500 to 1,000 foot candles. Placing the light fixture within six inches or so will provide them with that amount of light. Still, that is not a bright as a sunny day where there can be 10,000 foot candles shining on a plant. Just as people need sleep , plants require some darkness every day. So, dig out your Christmas light timer and set it so the lights go out at night for six to eight hours, that is sufficient for most plants. If you are really serious about growing a large number of plants under artificial light, special high output light fixtures are available starting at around $300 each. A while back, I mentioned I was planning on planting some seeds in the hoop house since the soil temperature warmed up so nicely undercover. Last week I planted about a third of the space with round red radishes, french slicing radishes, bib lettuce, a leaf lettuce salad combination, two varieties of spinach and a couple varieties of scallions. When I went into the hoop house to move away the inner plastic covering, I was surprised to see several lettuce plants growing. Those were the same ones I gave up for dead a few weeks ago. Since they are already growing, they have a big head start compared to the seeds I just planted. I decided to leave them in place and nurse them along thinking, may as well harvest them for salad since I really don’t need the extra room right now. At this stage of growth, those lettuce plants will act like a biennial instead of an annual plant. Biennials are plants that need two growing seasons to complete their life cycle. A complete plant life cycle starts with a seed that grows into a plant, the plant flowers then produces more seeds. Since biennials need two seasons, they grow the first season then go dormant through the winter. They start growing again in the spring, then flower and produce their seeds. Once the seeds are produced, those original plants die and the life cycle starts over again. Beets, onions, carrots and most of the cabbage family of plants are all biennials. Foxglove, pansies and hollyhocks are common biennial flowers. I have seen this type of thing happen before after a mild winter. Usually the lettuce plants will make some growth, then quickly flower and begin to produce seeds. I’ll just help them grow as much as possible and harvest them when they’re big enough to eat before they decide to start making seeds.